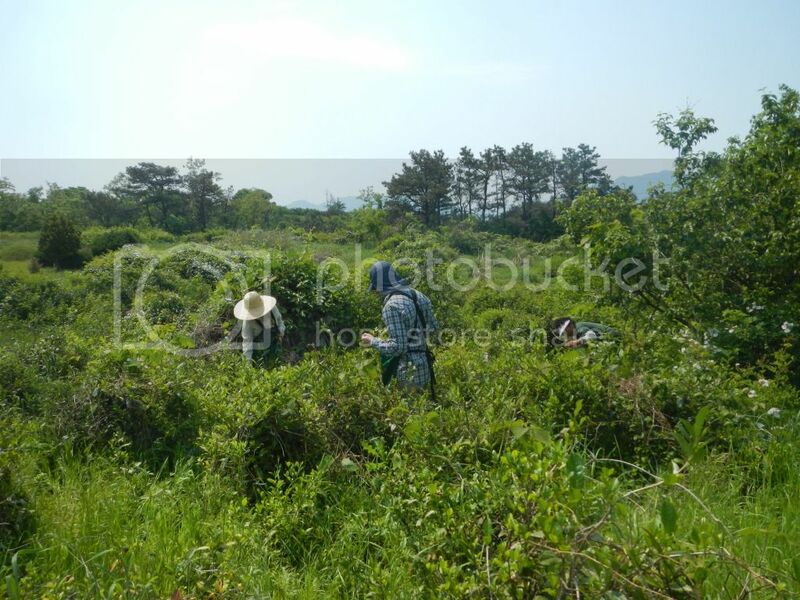 Last week we made the trek from Gimje to Gurye to spent a couple days on Mr. Hong’s tea field! It was one of the most memorable parts of the trip for me because everything I’ve learned about tea and it’s initial production process just came full circle for me. As a freshman joining the Institute last year, I thought that just by memorizing all of my notes I could do well on the test and drink my daily dose of tea. However, I never thought that the next year I would be using all of that knowledge in South Korea picking tea on a tea farm! Like when learning anything for the first time, the moment you get to use that knowledge in a real-world situation is always the moment when you truly grasp it. 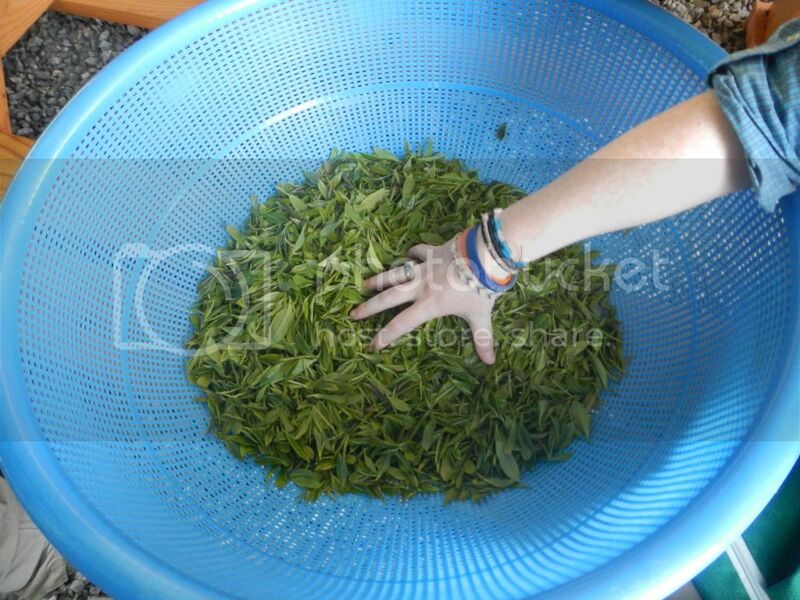 This was picking and processing green tea for me with Mr. Hong! We got to wear these phenomenal outfits while picking, giant hats, sunglasses, clothes that cover you fully, bags for the picked leaves and hiking boots!! It was awesome to pick tea leaves with the Halmays, the tea grandmothers, and just realize where the tea we drink everyday comes from. 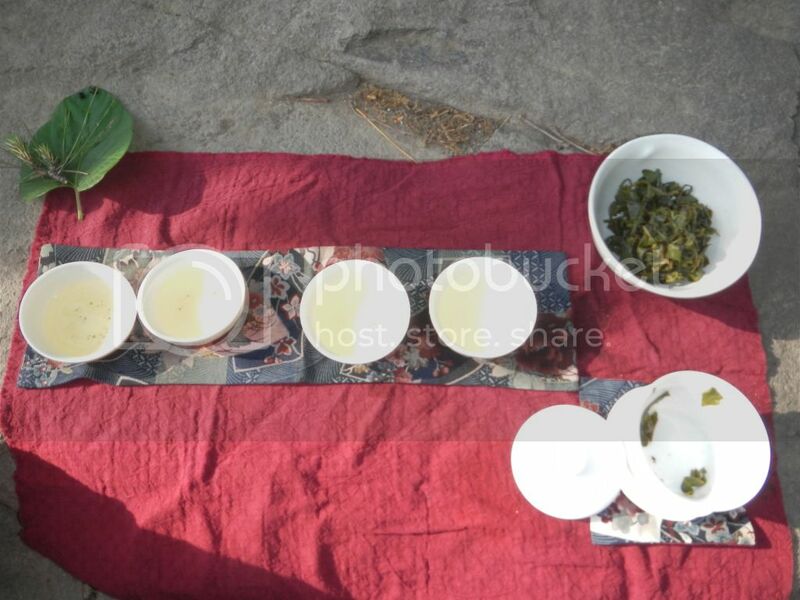 Those pu’er cakes or tightly rolled oolongs start out as small leaf and a bud pairings all over the tea bush. Then you see just how many bushes there are and how much work goes into the first process of tea production, picking the leaves. It was funny, I think the five of us picked half as much tea as one Halmay did, I don’t know how they do it! They’re just amazing, especially because they spend about 8 hours picking depending on the day! 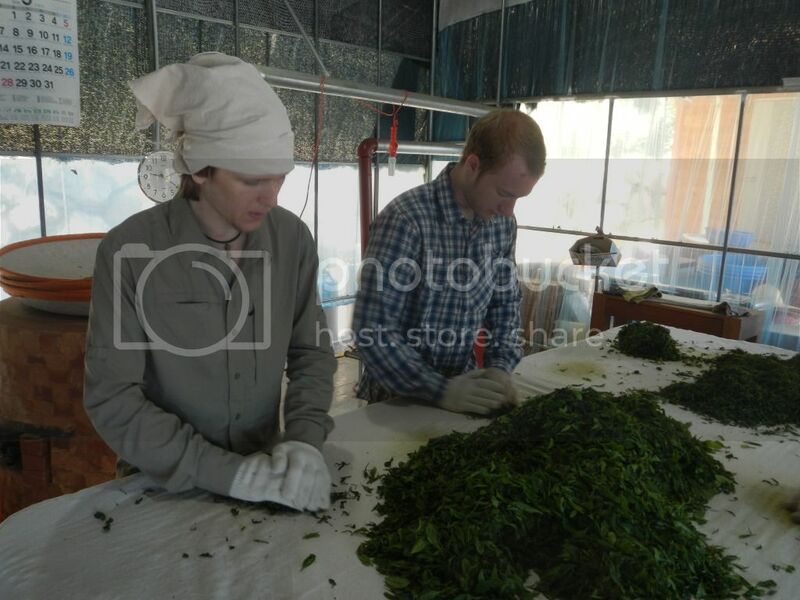 Next, comes tea production and the first tea we made was Nokcha, green tea! After putting on headscarves, 5 layers of gloves, and an apron we started. First it goes through a shaqing, just getting the moisture out of the tea leaves on a giant wok. Four of us had to constantly move and shake the leaves in the wok so the were evenly heated. After the each shaqing you must cool and separate the tea leaves….and repeat! Nine times probably took about 2 hours two finish. It was a lot of work but it was so awesome to experience, definitely worth every drop of sweat! I loved every minute of it! I have learned from this trip just how many things we take for granted. All the hard work and time it takes to make tea, tea ware, and other parts of the different ceremonies should always be remembered. With each brew, I know I’ll forever remember the people who helped me enjoy a cup of my favorite beverage and appreciate all that they do! Another cool thing is that we to keep the tea we made and bring it back to the Institute for everyone to try! So make sure you stop by the Penn State Tea House, when we get back during the Fall, to try the tea we put so much work and time into during our stay in Gurye! It’s great, I promise! Till next time and hope to share a cup of Nokcha with you next semester! Long after this trip has ended there will be several experiences that will still remain vividly in my memory. One of these experiences happened last week near the small town of Gurye. Nothing that I have done on this trip has enhanced my knowledge of tea culture more than working with Mr. Hong in his tea fields. Not only were we able to see the entire production process from start to finish, we were able to interact with the wonderful people that oversee and help with the production of this beverage we have all come to love so much. The first morning, we were greatest with an amazing breakfast of toast, homemade strawberry jam, and yogurt. It may not be the most traditional Korean breakfast, but it certainly filled us up for the day that lay ahead. Picking tea was unlike anything I have ever done before. 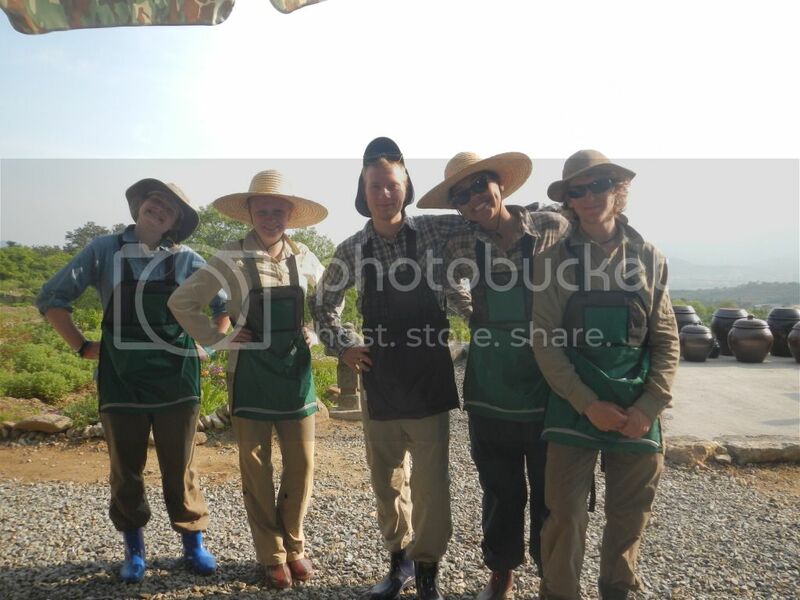 Done up in our fabulous outfits, consisting of wide brimmed hats, plastic shoes, and an apron complete with tea pouch, we were ready to begin the days work. The diligence and endurance needed for hours of work, hunched over in the scorching sun, is nothing to laugh at. The woman who do that same work day after day, from march till may, have my utmost respect. They also are far better at it than any of us. When we were done picking, the five us emptied our take into a basket. Our combined tea equaled the amount collected by just one of the grandmothers. After dinner. There was another new experience awaiting us. The days tea was ready for processing. All of us donned arm guards and four separate layers of gloves in order to withstand the head of the shaqing apparatus. We all leaned over the burning bowl and took turns stirring the tea with our hands. After each round we had to remove the tea and place it on the table to cool. For the first few rounds, we also rolled the tea. Rolling the tea involved collecting a pile of the tea leaves and rolling them roughly into a ball. Ever couple of minutes, we would pass our tea to the person next to us and begin again. Every round the temperature of the wok got cooler and the leaves became more brittle. After a few rounds we no longer rolled the tea and simple cooled it on the table. By the end of the night, my back was aching and my arms were burning, but I felt the greatest sense of accomplishment because, laid out before me, was a whole table filled with green tea. The next day, was more of the same. We spent hours upon hours in the hot sun collecting tea. Normally, this would dampen most people’s spirits, but we pushed through for the love of tea. Playing games while we worked helped as well. You never know how seldom some letters are used until you have to come up with a food or an animal that begins with every letter of the alphabet. On the third day, we got to learn the production for padiyocha. 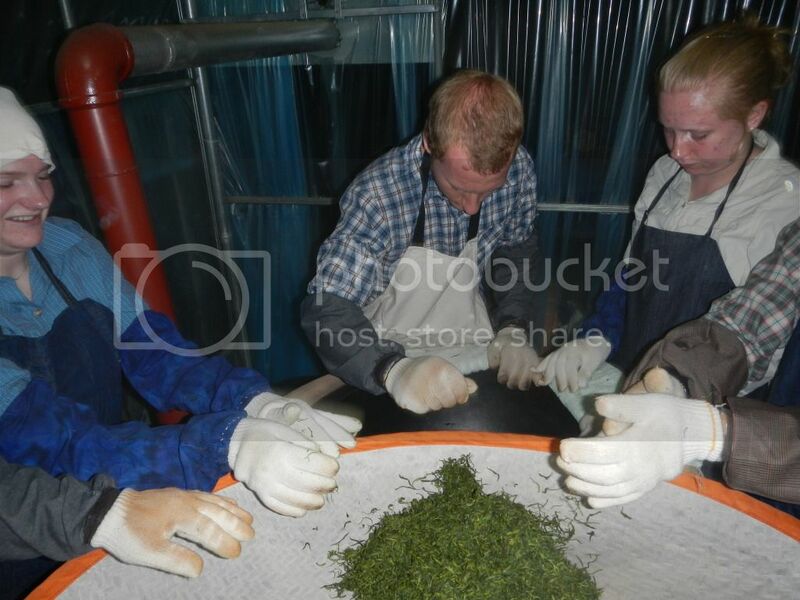 It was similar to the green tea we produced a few days before, but there was a lot more rolling involved. Mr Hong then put all the tea into an ongi pot to sit overnight. It is pretty cool how two traditional Korean practices work together to produce one amazing product. The time I spent with Mr Hong definitely gave me a greater appreciation for the tea I drink everyday. The production process is no longer a bulleted list on paper; it is a set of concrete steps that I have performed myself and understand. The people who produce the tea are no longer strangers; they are the friendly women who frantically waved at us to take water breaks and told us the best spots to pick tea. Above all, I now know how much work goes into the production of the wonderful beverage that I consume so much of . We arrived in Gurye just in time for dinner, we were met by the familiar face off Mr. Hong Kyong-Hee. Mr. Hong was one of the guests that flew in to Penn state to present on Korean tea ceremony and tea production methods. After a wonderful dinner we took a ride over to Mr. Hongs house where we drank his first picking nokcha. Before this tea I had never had a tea so fresh and recently produced. It would be an injustice to it’s magnificent flavor, active mouth feel and sublime qi to say this was anything but the best nokcha I’ve ever had. 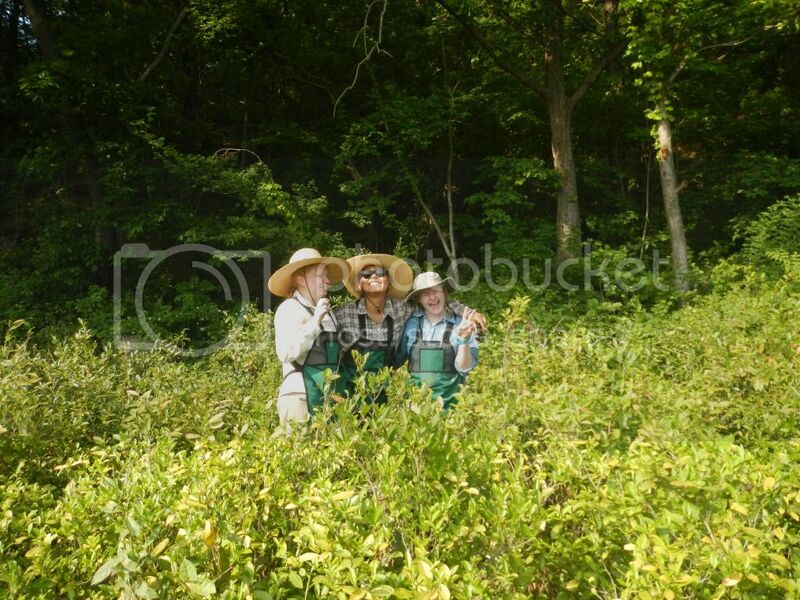 We all awaited the next day anxiously as it would be our first day picking tea. We awoke at 6 to pick tea but it had unfortunately rained over night so we decided to spend our morning trekking through some if the Jiri Mountain range. We hiked to the peak of the 800 meter high mount nogodan. 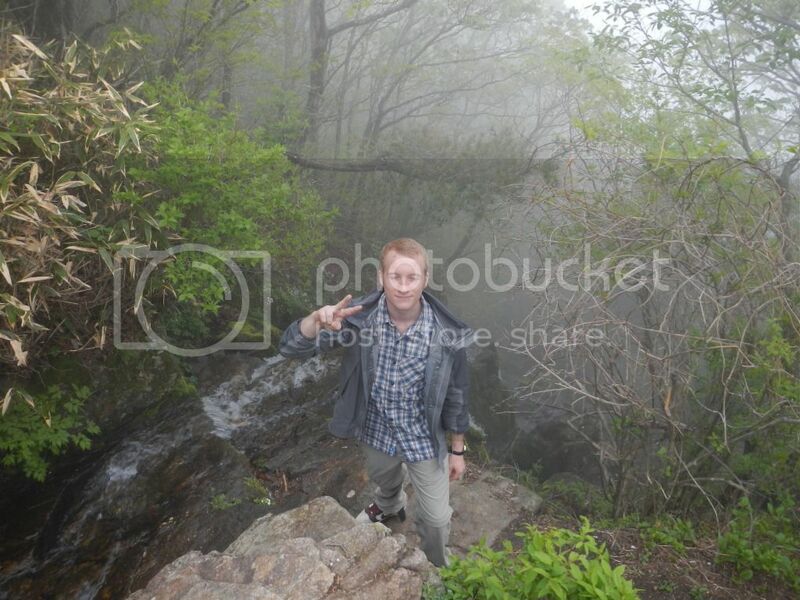 We walked through clouds, quite literally, making our way past beautiful streams and breathtaking rock formations. As we reached the top the clouds started to clear and we were rewarded with a beautiful view of the mountain range from the peak of one of it’s highest mountains. Around 1 in the afternoon Mr. Hong deemed the conditions fair enough to pick tea so we dawned our picking attire and got to work. We first picked tea in Mr. Hong’s fields surrounding his house. There were about 50 or so semi wild tea bushes. We were picking alongside 5 ‘helme’ (the term Mr. Hong used for grandmothers from the village) and after about 4 hours we picked most of buds from the field. Picking was tough work: being out in the sun, trudging through all forms of plant life to get to certain bushes, as well as fighting of some of the strangest bugs i’ve ever seen were only some parts of our picking experience. Picking tea although hard can also be relaxing, after picking for a while you fall into a sort of picking zen. A deep meditative calmness befalls you as you work your way from bush to bush scouring for leaf and bud combos. Slowly your eyes picked out buds quicker than they did before and by the end of the harvest you realize how much your picking skills have increased. However, we were always humbled when it came time to dump our pouches of tea revealing a measly kilo or so between the five of us. The helme would laugh and then dump about a kilogram of leaves each, a testament to there many years of work. After letting the leaves sit out to wither in the shade of Mr. Hong’s workshop for a few hours we started the processing cycle. We started with the Sha Qing in an approximately 275 degrees wok. We moved the leaves around very quickly in a circular pushing motion never allowing any leaf to sit around for more then a second or two. After a minute or two we removed the leaves and put them on a table with a fan blowing on them and we started to separate the piles of leaves to make sure they cooled quickly and evenly. We then grabbed decent size piles of leaves and balled them up. From here we rolled the leaves, it wasn’t a gentle job either. We rolled hard for couple of minutes in a long line. We then separated the piles again and repeated the wok drying,cooling and separating stages eight more times until we were left with a pile of leaves about a fourth of the weight of our original materials. The following wok processing stages were much cooler then the first, around 140 degrees. The processing was also very work intensive but going through the picking and processing stages really helped me get a more solidified idea of all the steps that go into making tea, the order in which it’s carried out, and many of the minor details that go into making a tea that you never come across in readings. The next day we picked tea from 7-12, had a nice lunch break, and then picked again from 1-4. This tea was destined to become padio cha. The tea was left out to wither til 8 the next morning. When we came into the workshop the next morning we pulled up our sleeves and got to rolling. We rolled the tea for about an hour and a half, which was a killer forearm workout, we all rolled a football sized wad of tea leaves at a time for about five minutes at a time and then passed it on to the next person. After rolling the tea was separated and packed into an ongi were it was left in an ondol heated room, covered with a blanket, and left for a day. 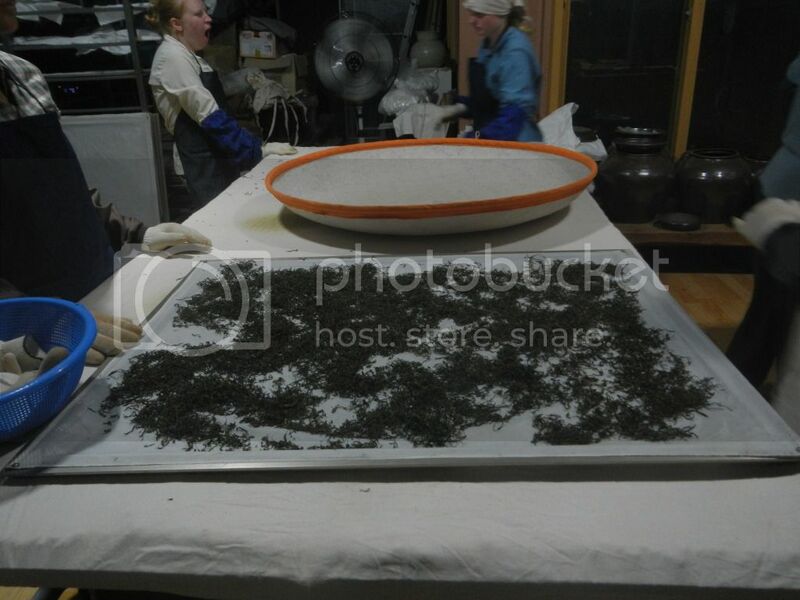 The next day the tea was spread out on a mat in the ondol heated room and was then left out for another 2-3 days. Tea is most certainly the worlds most labor intensive luxury good. Our time with Mr. Hong eventually came to end, a few days is all too short to spend with him. Brewing the tea we made is sure to bring back fond memories of picking, processing, and drinking tea with Mr. Hong. We all eagerly await the next chance we get to see Mr. Hong, and perhaps the next time we get to make tea with him. I guess you could say I’m a bit of a country bumpkin. The city is always fun and exciting, but for me, there is just something about the rural areas that make me feel alive, fully embracing the carpe diam inside me. So what happens when you mix my love of non-urban areas with my love of tea? You get another amazing part of this trip! We spent about 4 days with Mr. Hong, a master of tea production in South Korea. on our first day with Mr. Hong it was raining, so we were unable to pick tea until later in the day. We decided to have a low key and relaxing morning and climb a mountain. I wish I could describe the view, but no words in the English language would do it justice, and my Korean is a tad sub par. After our climb, the sun came out so we were off to the tea fields! We picked tea for a few hours, but only picked about 1% of what the helmay were able to pick. It was really cool to be able to interact with tea in its rawest form. And of course seeing and experiencing all of the work that goes into just the procurement of the tea laves made each cup we drank at Mr Hong’s all the more delicious. After dinner we went back to Mr Hong’s house and were able to actually assist in the production of tea. After putting on enough protective gear to make us suited for surgery, we started turning the raw leaves into this beloved beverage we love to learn about. It was awesome. We alternated between rolling the tea and tossing it in the shaqing. It was hard work, but so cool to be part of the process. We did this for about. 2 hours, and then were off to bed to prepare for our next day. Our next day was our first true tea picking day. We woke up at 6 and were picking tea by 7. I have to admit, spending 5 hours shoulder-deep in a tea field was definitely a high of my trip. I just gained such a higher appreciation for every tea leaf. After a quick lunch we were back in the fields for a few more hours of picking. Although I have to be honest I was exhausted after so much tea picking, but picking tea all day is probably the most enjoyable way to wear yourself out. As I’m sure many of you know; I study ChaXi with Teaparker (Chih Jung Sien) and Stephane Erler of Tea Masters Blog; and like them, I like to make ChaXi in far away, hard to reach, exotic locals. Sometimes The Penn State Tea House just doesn’t cut it, and I have a lot to do catching up with the greats! 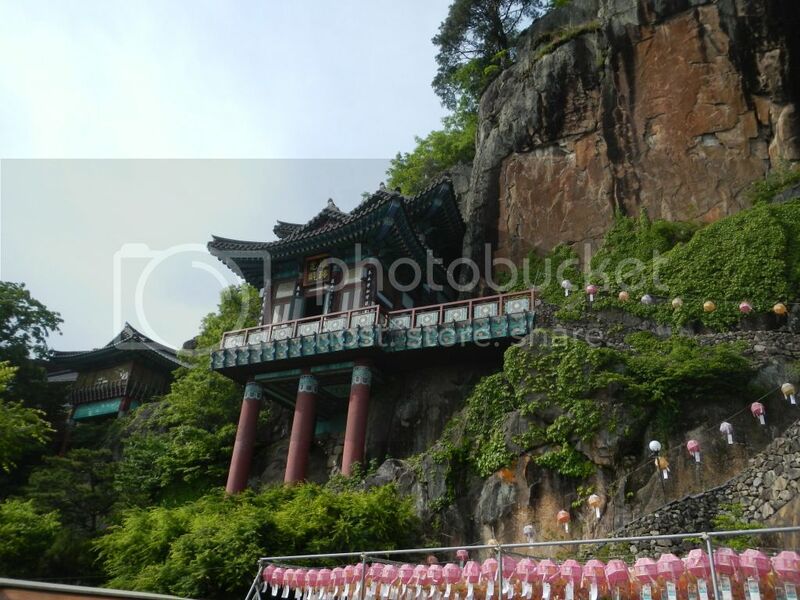 I got (very) lucky with this ChaXi at Yakcheonsa; its meets all the criteria above, and is strikingly beautiful with a Silla Dynasty carving of Buddha in the wall the monastery is built into. 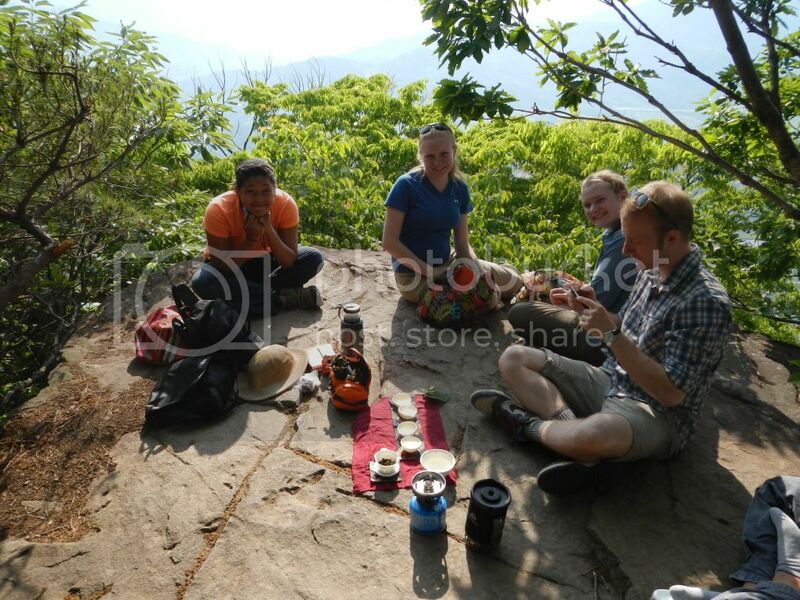 My students and I, with the guidance of Mr. Hong (Tea Master Hyo-Am), trekked up above the temple and laid out my travel ChaXi. It’s simple, 4 cups, a small Gaiwan and a waste water bowl; all Yinge wares save the bowl (It’s Korean, a gift from Sang Hun Lee). The view was beautiful, and, after the water finished boiling in my Jet Boil (a climbing/camping canister stove), all was silent save for the light conversation, the chirp of birds, and the stirring of leaves with the wind . Every once in a while a sound from the monastery would loft on the breeze and we would all be reminded of where in the world we were, or perhaps be called to a satori. We drank Stephane’s Fall 2011 GaoShan Luanze A Li Shan. The tea was full, yet airy like our rocky perch, and intensely floral. Siting up high looking down at the vally’s around us, only a tea such as this would do. This was a good session. More soon.